Strongest numbing cream that contains 10.56% pure lidocaine. It is the most perfect solution for skin pain relief while getting a tattoo, laser removal or any other minor surgical procedure. NumbSkin™ is recommended by medical practitioners and tattoo artists worldwide for painless skin procedures. Numbskin is the best numbing cream in the market that lasts up to 4 hours. 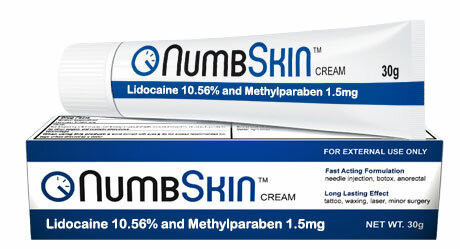 NumbSkin contains purest form of Lidocaine (in FDA permissible amounts). It can be purchased over the counter. It's the only water based numbing cream that does not interfere with the elasticity of the skin, qualifying it for the safest product in the market. This numbing cream can stay active for around 4 hours, depending on the amount applied. Based on the feedback from most customers, it has been observed that after application the pain is replaced by a minor tingling sensation.